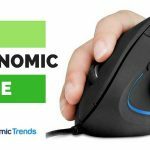 For big and tall users, shopping for anything requires a little more effort, whether it’s clothes, shoes, and even furniture such as office chairs. 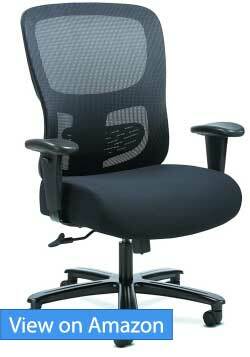 The standard office chair typically is geared towards people below 300 pounds and 6 feet tall (182cm). Everything from the dimensions of the seat and backrest, the hydraulic piston, to the cushioning are designed to operate comfortably and safely within those parameters, and isn’t something you want to skirt. 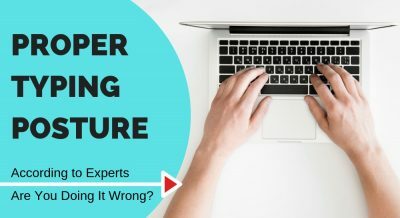 If you belong in the heavier or taller category then, picking the right office chair isn’t just a matter of comfort, but safety and longevity of your investment. 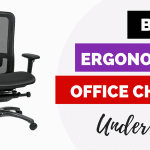 In this buyer’s guide I review the very best office chairs in 2019 for the big fellas, all of which can support a minimum of 350 pounds, come with extra wide seat and backrest, and thick cushioning that won’t deflate easily over time. Lets see these 5 best chairs now! 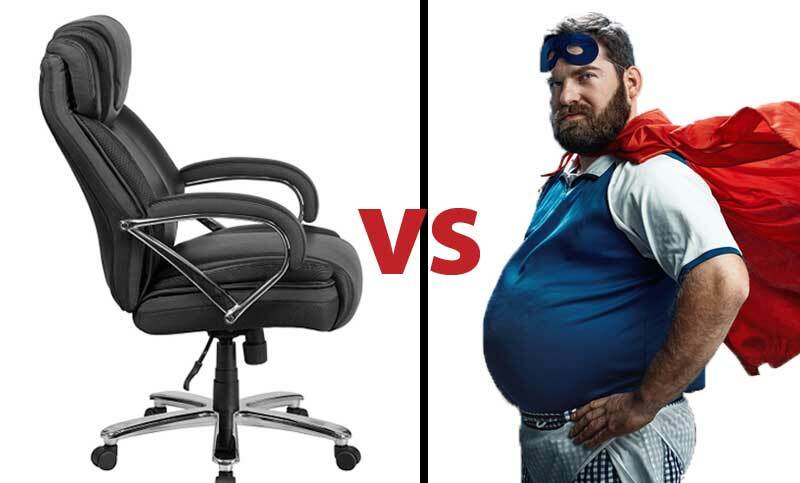 When it comes to big and tall office chairs, the Flash Furniture Hercules is a tank of a chair. It has an incredible weight capacity of 500 pounds, plus a generous seat width of 22” to accommodate even really large users with ease. A hallmark feature of the Hercules Chair is the extra thick 6” foam padded seat. If you’re on the heavy side, finding a chair that doesn’t sag quickly and that can support your body properly is difficult to find- with the Hercules this definitely won’t be an issue. The chair’s higher back design offers good coverage for your entire back, nestling you as you kick back. A standout feature of the Hercules office chair is the height adjustable headrest. This is the first time I’ve seen such a feature on a plush leather backrest. In concert with the tall back of the seat (25” tall), most users will find their heads fully supported and engulfed when they lean back into the Hercules seat’s pillow. An online user of the chair that is 6’4” tall remarked that this is the case even for him. 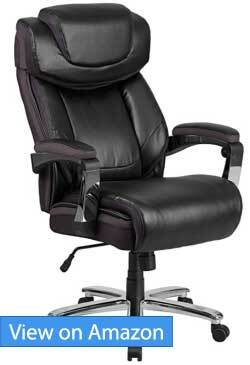 The tilt lock mechanism found on a Hercules provides you with a soothing rocking/reclining motion. Unfortunately the recline cannot be locked in, meaning the chair will always return to its upright position when there is no pressure. For people looking to doze off in their office chair every now and then, this may be a deal breaker. 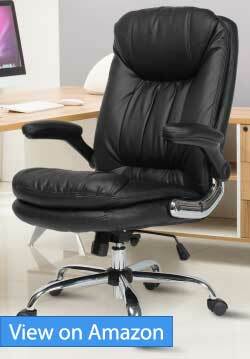 This ergonomic chair from Flash Furniture in PU leather is available to you in attractive Black, Brown or Taupe. With its embellished mesh trim, this is a chair that has been designed to look stylish in any office environment. 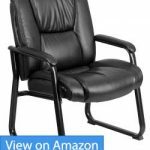 Topping it all off with a 5 Year Limited warranty, and the Flash Furniture Hercules Chair is one of the best all around big and tall office chairs, as long as you’re not looking for a reclining office chair. One of the most heavy duty office chairs you can buy, with 500 pounds weight capacity. Extra thick 6” thick foam padding to support heavy users properly. Large headrest that is height adjustable. Back seat doesn’t lock when reclined. One or two complaints about difficulty with assembling the chair. The Sadie Big and Tall Chair is an ergonomic office chair amplified to accommodate large users. 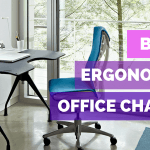 You’ll find most of the key features of a decent ergonomic chair in the Sadie, but in a heavy duty package that supports up to 350 pounds in weight. In terms of design, the most striking difference between the Sadie Big and Tall and many chairs in the same category is the choice of an all mesh curved backrest. For people with existing back issues, I’d argue the backrest on the Sadie is a better choice than the thick plush backrest found on other chairs. The gentle contour of the Sadie’s backrest follows the shape of your spine nicely, while the adjustable lumbar can be dialed in to further target the precise area in your lower back that needs support. Yes the mesh backrest on the Sadie isn’t as comfortable as padded backrest, but the upside is better ergonomics and heat dissipation over prolonged sitting. The seating area of the Sadie Big and Tall consists of a large area measuring 22” w x 22” depth. The seat cushion is surprisingly comfortable, with just enough firmness to prevent sagging. I also love the armrests on this big and tall chair, which can be individually adjusted for height so your arms are never left partially dangling. Lower back pain is a misery, but with the Sadie Big and Tall Chair you should find good relief without breaking the bank, nor the chair breaking on you in a few months as a large user. Very sturdy, with lots of metal parts. Comes with assembly tools – useful if you don’t have your own. 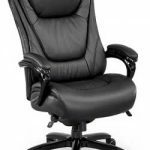 For big users looking for a truly luxurious office chair befitting of their larger than life status, the NBF Executive Tall and Big Chair may just be the perfect chair for you. 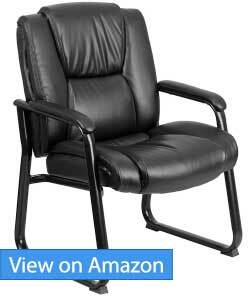 It features top grain real leather that’s awesome to the touch, long lasting, plus plush coiled cushioning that won’t sink and have your bottom scraping the frame of the chair over time. Real leather covers almost all areas of NBF Executive Chair, including the armrests. with only the sides and back consisting of polyurethane (that is 100% PVC-free). Unlike some synthetic or even real leather office chairs that omit foul or even hazardous fumes, the NBF Chair has been Greenguard certified. This means that the chair passes the stringiest tests for chemical emissions, and is ideal for environments where you may have children or people with allergy around. Not to mention it’s simply better for your health. 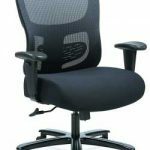 With an extra wide backrest that measures a massive 24.5″ wide and 29″ high, the NBF Chair provides excellent back support even for the largest of people. Throw in seat padding that is an incredible 7″ thick. with spring coils and memory foam that can support up to 400 pounds in weight, and it’s no wonder one owner of the NBF Chair has called it one of the most comfortable chairs he’s ever sat on. 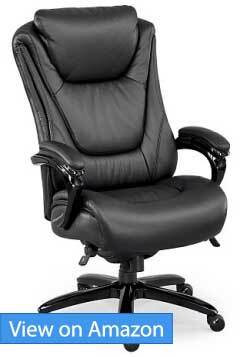 For people willing to shell out more money upfront, the NBF Signature Chair is a superb big and tall chair truly befitting of executive and CEOs. The real leather material means it is less prone to peeling over time, the Greenguard certification means it’s better for your health, and the thick 7″ memory foam and coil means it will support your body better and longer for many years. In other words, if you can afford the price, it is the best big and tall chair to get. With its soft leather and ergonomic design, the Yamasoro office chair is an ideal choice for big users that crave an all around plush experience on a budget. The PU leather is soft, water-repellent and won’t fade. 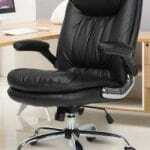 The real highlight of the Yamasoro Ergonomic Chair can be found in the seat. It’s made with high density foam combined with spring coils inside to provide just the right balance of softness and resistance to feel great, even for heavy users where seat sagging is a common issue. There are very few office chairs with built in springs in the seat as far as I’m aware, and the added resistance is definitely a welcomed edition for heavier set people. I love the high level of adjustability found on this ergonomic chair. It reclines up to 45 degrees backwards, and is lockable at any angle (finally!). This lets you put your feet up or even take a short nap comfortably. 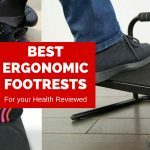 Other quality features worth mentioning are the folding padded armrests that go up when not needed, as well as the high quality 360°nylon casters which roll smoothly on the floor. The 5-star base ensures stability for this robust chair. 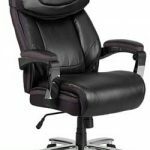 My only concern is the weight capacity of the chair- while technically it is a big and tall office chair with a weight limit of 350 pounds, some heavier users have reported issues with the hydraulic piston failing over time. Your mileage may vary, but it’s something to keep in mind if you’re near the suggested weight capacity for the chair. The company Yamasoro is known for their office chair production experience as well as their detailed craftsmanship. This high back chair is particularly stylish, and comes in a choice of black, brown or red colors. Tilting backseat that can be locked in at any angle. Foldable arms to save space when needed. Questionable hydraulic piston quality for heavier users. Last on our list of the best big and tall office chairs is something a little different- the Flash Furniture HERCULES Executive Reception Chair. Designed to be used as a secondary chair in your office, or as a guest chair in a reception room, the chair can be summed up in one word- dependable. Made out of steel tubular frame and reinforced components, the chair can handle an incredible weight of up to 500 pounds. If you’ve got a reception room, the wait for visitors can sometimes be long. You want chairs that won’t give under the weight of a heavy user, and long lasting. The Hercules reception chair certainly fits that bill. Despite the budget price, the Hercules Reception Chair is outfit with LeatherSoft, which is real leather with added polyurethane, making the leather super soft and luxurious. In other words, it’s much higher quality than normal bonded leather. And that’s the beauty of the Flash Furniture Hercules Reception Chair – they’re highly dependable, stylish and dare I say comfortable to sit in, but you certainly won’t be spending an excessive amount of money on them. They’re ideal for any business or home office needing good-looking, high performance guest chairs on a limited budget. I also love that there is no assembly required with the chairs. They have a steel tubular frame and a sled base which adds stability to the chair. The chair has a thick foam padded seat and back. The chair with padded arms is stylishly upholstered in genuine black leather upholstery. It it LeatherSoft which is leather with added polyurethane, making the leather super soft and luxurious. The back height from the seat is 22.5″. The chair comes with non-skid anti-tilt floor levers. 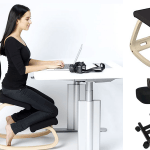 The sturdy chair is able to accommodate up to 500 pounds. The Waterfall Seat design which slopes slightly downward is excellent for relieving pressure on the back of the thighs. It improves blood circulation to the lower legs. Another benefit is that these waterfall seats enable equal weight distribution across the seat pan. With padded arms and contoured cushions the stylish chair is also ANSI BIFMA certified for safety and quality. A solid, non nonsense reception chair that can support up to 500 pounds. As a guest or reception chair, none. As a big and tall user, one of the most important things to look at when choosing an office chair is the size of the seat. Too small a seat, and you’ll feel constantly constricted; too big, and it’s like putting a kid in an adult chair, with everything misaligned. 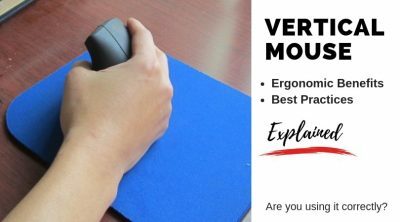 Here is the best way to determine the ideal seat dimensions for your body before you buy your next chair, especially online where you can’t try it out first. Step 1: Sit down in any existing chair in your home in an upright position, your back flat and tailbone flush against the backrest. Open your thighs up slightly in a “v” shape position as you normally would when seated. Step 2: Calculate the best chair seat depth for your body. With a measuring tape, measure the distance from your tailbone (where it touches the backrest) to the end of your inner thighs. After that, subtract 1-2 inches to derive the best seat depth. This is the seat depth that comfortably supports your bottom while leaving a small gap at the end to allow proper blood circulation in your inner thighs and legs.. Step 3: Calculate the best chair seat width for your body. While seated, open thighs slightly or to your normal amount. With a tap, measure the lateral distance across your thighs just before they drop off the seat’s edge (Assume ideal seat depth, or 1-2 inches before end of inner thighs). 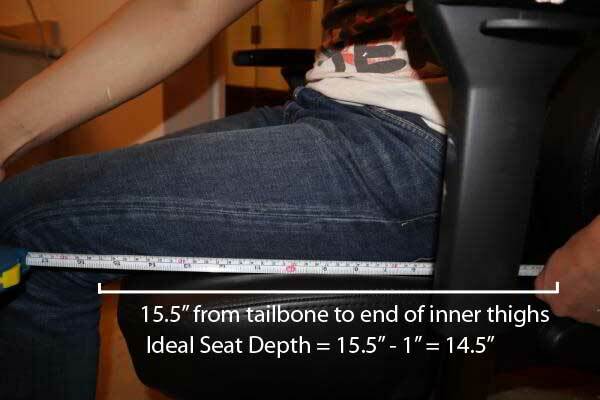 Then, add 2 inches to get the ideal seat width for your body. This is the seat width that comfortably supports your body laterally while leaving a 1 inch gap on either ends to allow some wiggle room. If you often sit cross legged with one or both legs on the chair, add another 3 inches to the final measurement. While all 5 of the big and tall office chairs reviewed above are superb, which one to choose really depends on what you’re looking for. The Flash Furniture Hercules Chair is the best for most people due to the perfect balance between being heavy duty (500 pounds weight limit), comfortable, and budget friendly. However, if you have specific needs such as a breathable mesh backrest, the Sadie Big and Tall Chair is your obvious choice. Those willing to spend more to get a better version of the Hercules Chair should get the NBF Signature Chair, made with low emissions real leather material. And finally, the Yamasoro chair is an awesome big and tall chair on a budget, while nothing comes close to the Flash Furniture Hercules Reception Chair as a heavy duty guest chair.